So much has been written about the history of major league baseball that it’s startling to come upon a book that shares stories about teams and sports legends that most people have never heard before. That’s because the popular history of baseball during the Ty Cobb, Babe Ruth, Joe DiMaggio era is strictly an east coast tale. But for 50 years or more, a third league — almost on par with the National and American Leagues — flourished on the west coast. The Pacific Coast League story launched the careers of Joe DiMaggio and Ted Williams and incubated teams that eventually made it to the big leagues themselves: Los Angeles, San Francisco, Oakland, Seattle, and San Diego. 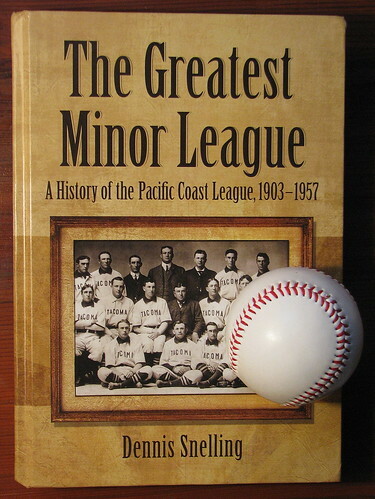 The Greatest Minor League, A History of the Pacific Coast League, 1903-1957 by Dennis Snelling [LibraryThing / WorldCat] is full of surprises for serious baseball fans who THOUGHT they knew all the baseball lore there was. My little home town of Tacoma, for instance, had a baseball championship before every western city except L.A. (That’s the Tacoma squad on the cover.) Joe DiMaggio had a 61 game hitting streak in San Francisco before he had the famous 56 game hitting streak in New York. Babe Ruth wanted to play for San Francisco and tried to get manager jobs in Seattle and Oakland. A team in Hollywood experimented with baseball uniforms featuring shorts. The Black Sox scandal of 1919 involved the PCL. And everyone from Rogers Hornsby to Casey Stengel to Billy Martin to Tommy Lasorda had something to do with the “third major league” out west. There were impressive slugfests, no-hitters, pennant races, and a “Wrigley Field” in this largely forgotten story. There were even early team tours of Japan, spreading the game internationally. Yes, the people living in the western United States knew of Ruth and Gehrig and Greenberg, but those were stars from far away. The Pacific Coast League was a major league unto itself, scouting and growing talent, west coast stars, and attracting crowds. The Seattle Rainiers* had better attendance in the 30s and 40s than most major league teams back east! Snelling’s research was thorough, including on-the-field AND off-the-field antics, successes, and tragedies. And he did a remarkable job telling the stories, year by year, in ways that make pull you into the team rivalries (e.g. Seals-Angels) as understandably as if he were writing about the more familiar Red Sox-Yankees. The personalities of owners and players thread through the decades with ease, too. Reading this book is like stepping into a parallel baseball universe where the names and struggles are familiar but all new. It’s a history of baseball … that has a different history than you’ve heard before. *Another book on the topic that I’ve read and would recommend: Pitchers of Beer by Dan Raley [LibraryThing / WorldCat]. It follows the history of the Seattle Rainiers, one of the best teams from the Pacific Coast League.